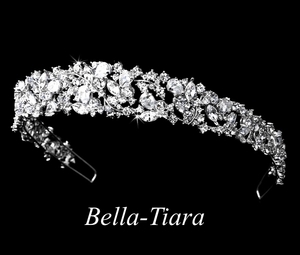 Description: This magnificent bridal tiara will definitely make you feel like royalty on your big day! A stunning collection of round, pear and marquise cut cubic zirconia crystals elegantly sit in stunning silver plating and vividly sparkle in the light. This majestic bridal tiara will look great on any classic bride with a white or ivory wedding dress. Also available in Gold.